Okay, after trying the Orange Crush, Hawaiian Punch, and Kool-aid water enhancers I had just pretty much gave up on the entire idea. Too much trouble and drama. Oh and some of them just plain sucked. 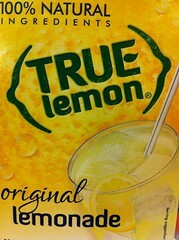 Then I stumbled onto this brand- TRUE LEMON – Lemonade. It is a box of small sleeves of powder that you just pour into a 16oz bottle of water and shake it up. It’s made from lemons, lemon oil, and lemon juice among other ingredients. Now you know how much I love lemonade and this is pretty good for a powder-instant-mix. I kept a few in my bag and whenever I wanted a drink I doctored up a water bottle and had some tangy and slightly sour-y lemonade taste that I was looking for. It’s clean, light, crisp, and didn’t have that aftertaste I found in other “water enhancers”. They have several flavors and you get 10 for about 3 bucks. Of course it’s nowhere near as sweet-n-sour as a freshly made homemade lemonade…but if you just can not stand drinking plain old water – TRUE LEMON will change your mind about water enhancers. This is the one to get.